The song was commissioned by the Festival Oude Muziek Utrecht (Utrecht Early Music Festival), for the rather unusual scoring of positive organ, theorbo, bass gamba and two sopranos. The sopranos were Eugénie Warnier (artist-in-residence in the Utrecht festival) and Elodie Fonnard. The ensemble is the Strassbourg based Le Parlement de Musique, led by organist Martin Gester. These are the folks that worry the man that lives in the house that I built. Modern compositions for period instruments no longer have the novelty they once did, yet there are a handful of works that grab hold of the listener and inspire the imagination. 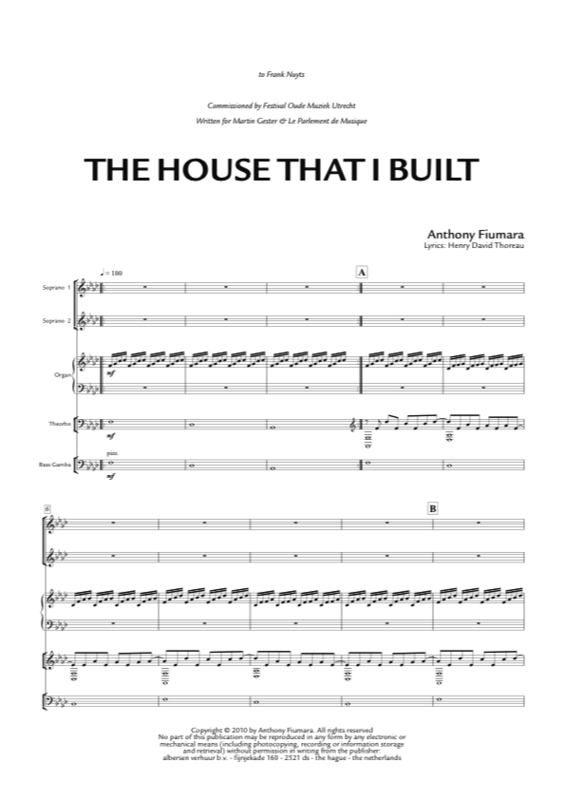 The House That I Built by Anthony Fiumara is one such piece that hypnotizes from the sounding of the very first notes. Commissioned by Festival Oude Muziek Utrecht. Le Parlement de Musique, with Eugénie Warnier & Elodie Fonnard (soprano), during the Festival Oude Muziek in the Pieterskerk, Utrecht.